With an empty garage for a couple of weeks, and winter not that far away – this seems like a good excuse to finally tackle my porous garage. With the door closed, I could see daylight everywhere. But the main issue was the water that gets blown under the garage door. This is basically a 4 inch high solid piece of rubber, like a mini speed bump. 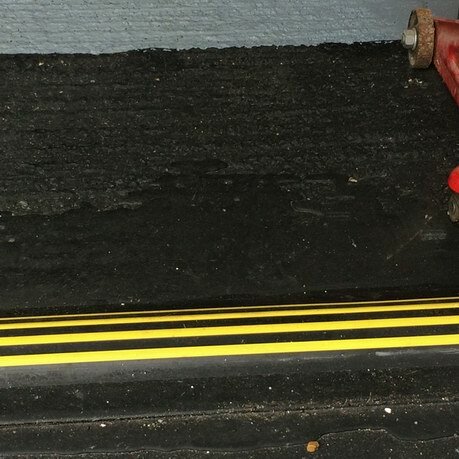 It’s fitted on the inside of the garage, so that when the door closes, it is pressed up against it and makes a waterproof seal. It wasn’t simply a case of sticking it to the floor though, as the garage floor was textured and not slightly even. So in preparation I laid down some floor levelling compound, then painted it black. We’ve had some freakish storms since, and I am glad to say that this, coupled with some strategically placed rubber “flaps” around the top and left & right sides of the door – has meant not a draft or raindrop has come in.